Which Video Game Company Originally Sold Leather Goods? The deadliest wildfire in recorded history is largely unknown due to a coincidence that saw it greatly overshadowed in the news of the day by a higher profile disaster. On October 8, 1871, a small number of controlled burns to clear forest land and fields around Peshtigo, Wisconsin were underway. A cold front moved into the area, pushing strong winds across the region and causing those fires to quickly grow from small controlled blazes to raging fires. The dry conditions and strong winds lead to a massive firestorm, with winds in excess of 100 miles per hour spreading superheated flames across northeastern Wisconsin. The effects were devastating. All told, the firestorm consumed a staggering 1,200,000 acres, burned entire towns down to their foundation stones, and is estimated to have killed between 1,500 and 2,500 people. Why such a broad estimate? The firestorm consumed all the records stored in the region and historians have had to estimate population counts for the small towns and farms the fire ravaged. 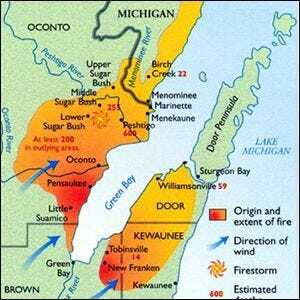 So why is the “Peshtigo Fire” not as well known as other American disasters (such as the Three Mile Island nuclear accident or the San Francisco earthquake of 1906)? The firestorm in Peshtigo just happened to occur on the same day as the Great Chicago Fire of 1871—a disaster that killed a fraction of the people, but left 100,000 homeless. Newspapers across the nation ran with the Chicago story and Peshtigo was not only overlooked, but almost entirely forgotten. Image courtesy of the U.S. National Weather Service.